On Monday, Bayer AG detailed its offer to buy Monsanto for $62 billion. Bayer, a German drugs and crop chemicals company, which makes Aspirin and Alka Seltzer, among other things, could then grab the top spot in the quickly consolidating farm supplies industry. Monsanto has said it would review the proposal. If it goes ahead, the acquisition would be the largest all-cash takeover on record, according to Thomson Reuters data, and it would also eclipse a planned merger of Dow Chemical and DuPont’s agriculture units. Further, it could cover up a name that even Bloomberg recognizes is associated with evil. 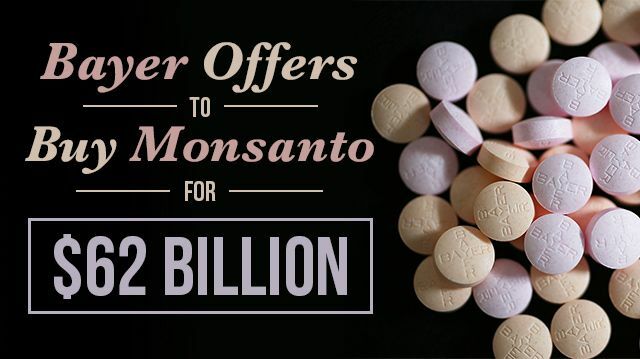 That is, Bayer would probably abandon the Monsanto brand name, an anonymous person told Bloomberg — just as it did after buying Schering AG for $22 billion in 2006. Monsanto and Bayer combined have quite the criminal record, going back over a century. Monsanto, for most of its history, was involved in heavy industrial chemical production, including supplying the deadly and devastating Agent Orange to the US for its war in Vietnam. Then, after the US’s war in Iraq, Monsanto, along with Cargill and Dow Chemical, took over the country’s agriculture. Iraqi farmers weren’t allowed to save seeds or share them, seeing one of the world’s first sites of agriculture eventually only producing four percent of its own seeds, according to Dahlia Wasfi, a doctor and environmental activist. In the US, Monsanto has gained control over various agricultural industries by building up a monopoly, putting farmers out of work, and suing farmers whose fields were contaminated with Monsanto seeds. It also increased the price of its herbicide, and exploited its patent on transgenic corn, soybean, and cotton to squeeze out farmers using nontransgenic seeds. Further, the company has been accused of dumping its plethora of toxic chemicals into the water supply of various countries, then often filtering the water it has destroyed to sell it back to the public. Its production and market strategies promote monoculture, which has been proven to damage the soil. By focusing on a few commodity crops, biodiversity is being reduced, and pesticide resistance is promoted, seeing the company stand in the way of sustainable agriculture. It, and other biotech conglomerates have also been linked to the decline of bee colonies. Bayer, meanwhile, was also implicated in the development of chemical weapons. During WWI it helped develop a range of poisonous gases used in the trenches, including chlorine gas and mustard gas, according to Corporate Watch. In order to keep up its profits, Bayer has tried to stop people having access to vital medicine. During the anthrax attacks scare, Bayer refused to allow other firms to produce ciprofloxacin hydrochloride so that it could profit from sales of Cipro, its patented drug that cures anthrax. And in South Africa, Bayer was one of various companies that filed a lawsuit to stop the government from overriding patent protections to use generic AIDS drugs, in a failed attempt to deprive AIDS victims from vital and affordable medication. Bayer exported highly toxic, obsolete pesticides to Nepal, abandoning them there after they expired or were banned, and it used big ships to dump concentrated sulfuric acid into the North Sea. The company also faced criminal charges in Brazil for poisoning coffee growers with the pesticide Baysiston. What could be done for the environment or poverty with $62 billion? Just with the money Bayer is proposing to buy Monsanto with, homelessness in the US could be eliminated three times over. According to a Housing and Urban Development official, it would cost about $20 billion for the US government to effectively eliminate homelessness. The money involved in the deal is the same size as the economies of Zambia and Afghanistan, and more than the economies of 88 other countries. Such money could also go towards solar farms to produce 24,000 megawatts of electricity: enough energy to power four million homes. But here’s the big one: the UN estimates it would cost $30 billion a year to end world hunger. That’s right, instead of putting farmers out of a livelihood, this Bayer purchase could end world hunger for two years. In Toronto, Canada, protesters denounced the recent approval of genetically modified salmon in Canadian markets. As a result of protests like these, efforts to label GMO foods in the US are gaining momentum, and family and community farms are taking off. Nearly 40 countries have banned GMO crops and the use of Monsanto’s Roundup. The potential Bayer-Monsanto merger may seem dauntingly huge, but working together, people are having an impact. Tamara Pearson is a teacher and longtime journalist based in Latin America. She is the author of The Butterfly Prison. Previous articleToday Is The 10th Anniversary Of Al Gore’s Award-Winning Documentary: What Has Changed? Hey Buddy!, I found this information for you: "A Marriage From Hell: Bayer Offers Monsanto Billion To Make Monster Seed and Pesticide Company". Here is the website link: https://www.thealternativedaily.com/bayer-monsanto-purchase/. Thank you.